The NBA champion Cleveland Cavaliers have added a new dimension to halftime shows and 60-second time outs, thanks to the Christie Pandoras Box media server and Quince Imaging. 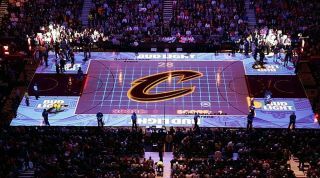 Using a combination of 3D mapping techniques and video content produced by the Cavaliers own QTV team and Christie Pandoras Box, Quince Imaging transforms the Quicken Loans Arena basketball court into an immersive environment featuring a classic pong-style game with participants competing against each other from each end of the court. The “Cavaliers Arcade,” sponsored by various companies, sees participants come down to each end of the court to battle it out. For the full-court, Pong-inspired game that happens during a timeout, selected fans compete against each other using motion-tracking rackets to pass the virtual ball back and forth from one end of the court to the other. The draw for teams and sponsors is that during a timeout or a long stoppage in play, fans are looking at the court surface. Gazzillo recently learned that sponsors are as interested in the fan experience in the arena but also after the event when the experience is all over social media, websites, and other online platforms. The Quince Imaging team continues to develop additional programming for the on-court entertainment—keeping the fans’ focus on the court during the pre-game, timeouts, and halftime. With the Philadelphia 76ers and several other NHL and NBA teams using Pandoras Box, Quince Imaging continues to field questions from potential clients, wondering how they too can learn not only how the projection can be branded, but how to further the experience with post-game entertainment using interactive projection mapping. “While programming tracking last year, we brought the Cavs video producer onto the court and said ‘While we’re all on the court, would you like to try a new beta of a game we’ve been developing?’ It was a complete surprise. Watching him playing the pong-like game and getting all excited and enjoying himself—I think that just about says it all,” Gazzillo said.